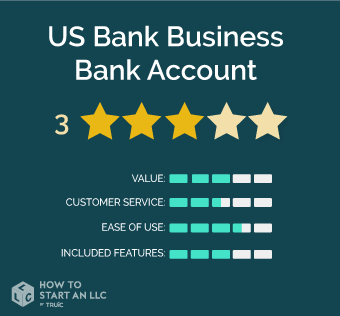 U.S. Bank is typically ideal for businesses who work with cash or who may need a free bank account without a minimum balance. For many businesses just getting started, U.S. Bank may be the most accessible banking option available. With over 3000 locations and 4,500 ATMs across 25 states (mostly concentrated in the west and midwest), U.S. Bank is the most convenient option for many Americans. Their Silver Business Checking package lets you open an account for free without any monthly fees or minimum requirements. Unfortunately, U.S. Bank’s premium accounts fail to offer the extra features or added value you would like to see. They also have a tendency to add several hidden fees. As far as national banks go, their interest rates are average, and you will likely be able to find a better offer elsewhere online if you do not need a physical bank. Who is U.S. Bank right for? Note: You must open an account with U.S. Bank in person. No minimum requirements for free checking. Many locations across the western half of the U.S. Hefty fees, including overdraft, transfer, and cash deposit limit fees. Customer Support email and phone lines are poor, though local banks may offer more help. Lacks extra features or rewards offered by competitors. Typically, US Bank customer reps will work with you and adjust specific pricing details and features to fit your company. Still, this section will give you an overview of what to expect. Business Reserve Line -- A $1,000 to $5,000 unsecured line of credit for overdraft protection. Discounted card reader for $49 when you sign up for their Clear & Simple Pricing program through U.S. Bank Payment Solutions. Who should open a Silver Business Package? This package is best for new businesses that do not expect to maintain high balances. If you expect to maintain a $10,000 balance in your business checking account, and would like to access perks like lower transaction fees, cash bonuses, and preferred rates, the Gold package is worth the upgrade. $25 monthly maintenance fee plus $0.40 for each transaction above 500 per transaction limit. Who should open a Platinum Business Package? The Platinum Business Package is for high volume accounts that want to maximize their perks, minimize fees, and open a Money Market account as well. Who should open a Basic Business Savings? This is a starter Savings account for those expecting to maintain one low-volume Savings account. You get five sweeps from savings to checking per monthly cycle. Upon the sixth sweep, all funds remain in the checking account until the end of the cycle. Who should open a Business Savings Sweep? If you have multiple or high-volume business checking accounts, this is a high-yield way to manage your accounts. Who should open a Platinum Business Money Market? Platinum Business Checking account holders, as well as other high volume U.S. Bank customers, should use this account. Who should open a Premium Business Money Market? For some high volume account holders, this may be a better fit than the Platinum option. We recommend talking to a customer support agent. The good news is that U.S. Bank lets you get started for free. Their Silver package has no monthly fees, and the Monthly Maintenance Fees at the premium levels can be voided if you meet certain balance minimums. Premium accounts will also give you special discounts on other U.S. Bank products, including their Cash Flow Manager, Rewards Credit Cards, and Money Market accounts. Unfortunately, U.S. Bank makes you subject to a litany of fees, and there is often a lack of clarity surrounding them. They charge hefty overdraft and wire transfer fees, and the fees for cash deposit limit, transaction limits, and going under balance minimums can sneak up on you. Often, additional fees like these will just get added to your “Monthly Maintenance Fee” with no description, which can be confusing. As far as interest rates and special perks or rewards, U.S. Bank is fairly middling. While tellers can sometimes work with customers to sweeten offerings, this may not be ideal for premium customers. U.S. Bank’s best value will be for Silver Package customers with relatively low transaction volume. We did not have good experiences with U.S. Bank’s corporate phone or email support. Their phone line is characterized by long wait times and their reps tended to talk in general terms, which can be difficult if you want a question answered. Emails went unanswered for days. Fortunately, most U.S. Banks users will rely on their local branch. Experiences will vary across locations, but typically it can be fairly easy to build relationships with tellers and managers. U.S. Bank offers a strong mobile app with a fairly high degree of functionality. Obviously, U.S. Bank lets you deposit cash, which a lot of trendier web-based bank accounts don’t, and they also let you make deposits from mobile. You can easily make payment requests and send money anywhere in the country for free on mobile. For checking account users who utilize U.S. Bank’s other products, everything syncs fairly well. Theirs is a no-frills product, and their online layout is pretty basic -- but then again, basic can make things easier. U.S. Bank will give your business everything most users have come to expect from a bank account, but not much else. They lack a lot of unique features, aside from a discounted card reader. Still, you get solid security and fraud prevention, special offers for Rewards Credit Cards, payment processing, and a Business Reserve Credit Line. For many businesses, this can be more than suitable. But if you expect to maintain a high volume account, there are better interest rates and perks to be had. If your business is launching near a U.S. Bank location, they can work well. They are a perfect starter bank account for businesses with low transaction volume or inconsistent balances, and they can work with you as your company grows. For customers looking for more advanced banking packages or preferable rates, U.S. Bank will not do as well as Chase, for example.